Is your business on YouTube? Hey, it’s not 2010 anymore. The takeover of video content marketing has been a long time coming as more and more brands have made the leap to YouTube. 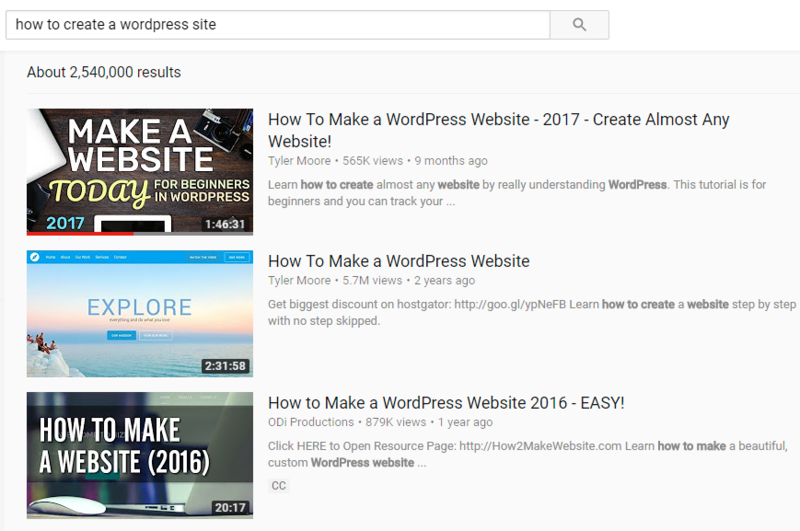 Whether it’s in the form of bite-sized how-to’s or long-form tutorials, YouTube content represents a cost-effective way to educate and entertain your audience. Connecting your business to YouTube can be done in a matter of minutes. That said, there are some overlooked elements of creating a YouTube business account that marketers need to pay attention to. So, ready to set up your YouTube business account? Yeah? Let’s dive right in! First thing’s first. Before you can get started on YouTube, you’re going to need a Google account. 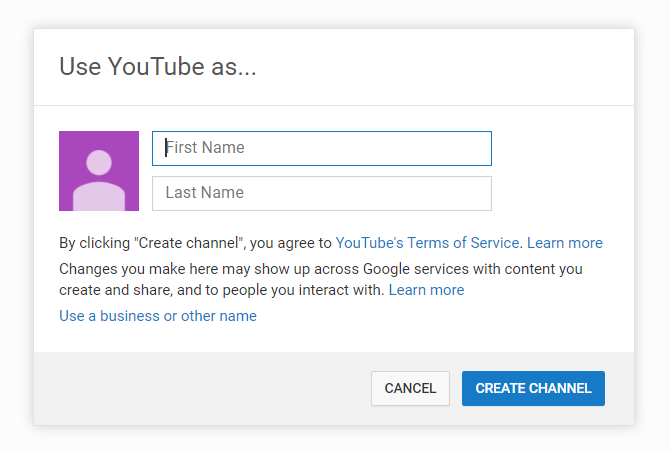 Now, you can either create a new, dedicated account specifically for your YouTube business channel or use an existing, personal account. Creating a new login is often ideal as you don’t have to worry about security issues tied to your personal Gmail. Ultimately, the choice is up to you. As a side note, you don’t have to use your business’ name when creating a brand channel account. YouTube gives you the option to use a business name, which we’ll cover shortly. Once you’ve created your Google account, make your way over to YouTube’s homepage. To begin customizing your channel, click on the avatar icon on the top right corner of the screen. Click on “My channel” from the drop-down options. You’ll then be prompted by the following screen which asks for your first and last name. Notice that YouTube also gives you the option of using a business or product name for your channel as noted earlier. Unless you’re a solo business owner that wants to be associated with a personal brand, creating your channel as a dedicated business account makes more sense. Click “Use a business or other name” which will lead you to a screen where you can enter your brand’s name. The name you choose will be the one associated with your YouTube business account. 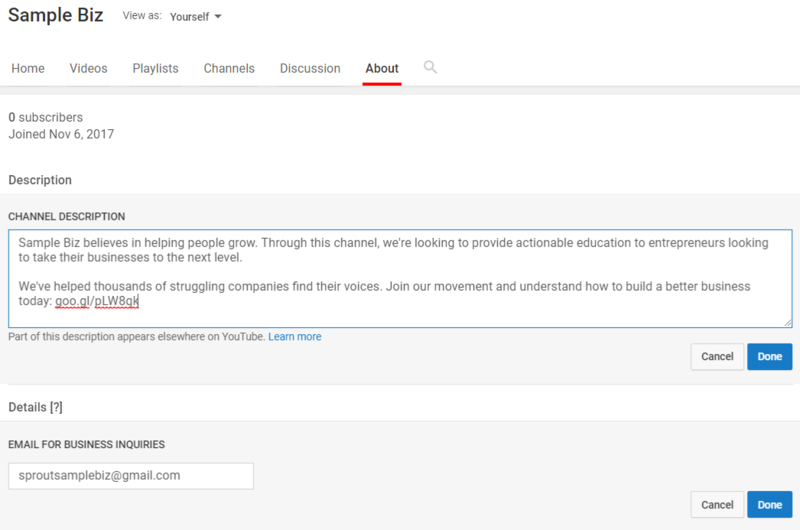 Now that you know how to create a YouTube account, it’s time to make your channel a bit less bare-bones. Below we’ve outlined the steps to fine-tuning your channel to attract attention from viewers and search engines alike. There are many moving pieces to any given YouTube channel, but the following represent some must-do’s for brands. Click on the “Customize Channel” link to get started. You’ll be presented with the following screen which clues you on what your channel needs to appear more complete. Before anyone actually views your video content, make sure that you’ve crafted imagery for your channel that clicks with your brand. Just as you have a dedicated icon and banner for the likes of Facebook or Twitter, YouTube is no different. Channel banner: 2,560×1440 pixels, safe area for mobile and web (without text and logo cropping) is 1546 x 423 pixels. Since these dimensions are relatively large, you need to use high-res images rather than pictures that could get cut off or distorted. This is where resources such as Canva as invaluable as you can craft such images in a matter of minutes thanks to their ready-to-go templates. Meanwhile, updating your channel art provides a straightforward image upload screen as well. And here’s the end result of updating our sample channel’s imagery after whipping up a couple of quick examples in Canva. There is no blanket approach to YouTube images, which provides brands with plenty of creative freedom. 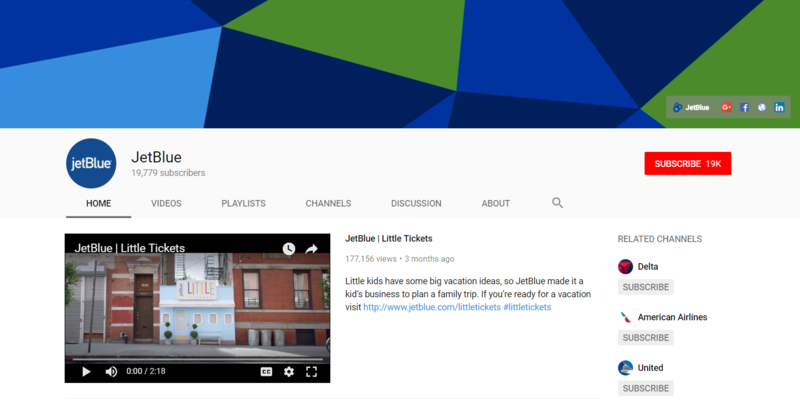 Brands such as JetBlue take a relatively simple approach with their logo and banner, for example. It may take some experimenting to get your YouTube business channel’s images to your liking, but taking the time to make your channel aesthetically pleasing is most definitely worth it. Easy to overlook, the “About” section of your profile is a crucial piece of figuring out how to make a YouTube account that actually results in long-term leads and followers. Not only is this a place to make a personal impression of your viewers, but also funnel them to your social profiles or homepage. Channel descriptions don’t have to be rocket science, though. A brief mission statement or welcome message is all that’s really necessary. If you want to include a few links or call-to-action, that’s totally fair game as well. Oh, and don’t forget to add a business email as an extra point of contact. The last piece of your description is arguably the most important. That is, adding in links to your homepage, social profiles and any other places you’d like your YouTube traffic to land. Including these links increases the chances of your traffic becoming long-term followers of your brand. YouTube allows you to add up to five links and customizable hyperlink text up to 30 characters. As an added bonus, YouTube adds your site’s social links to your channel banner to make them even more accessible to viewers. Your description isn’t a place to stuff keywords, but rather let your viewers know the purpose behind your YouTube business channel and what you’re doing beyond the realm of YouTube. Just like any other social network, YouTube represents a community. Signaling yourself as an active participant in the community means following other channels, liking other videos and letting your viewers know that you’re involved in your industry. Highlighting featured channels and “liked” videos is a subtle way to show your fellow YouTube creators some love. Likewise, it’s a smart strategy to make your Youtube business channel appear more active if you don’t plan on uploading on a frequent basis. On that last point, try to keep things strictly professional in terms of activity on your YouTube business. If you want to “like” the latest Taylor Swift video or leave a comment on a political video, do so on your personal channel. In your channel settings, make sure to have your subscriptions and “liked” videos set to public so viewers can see them. 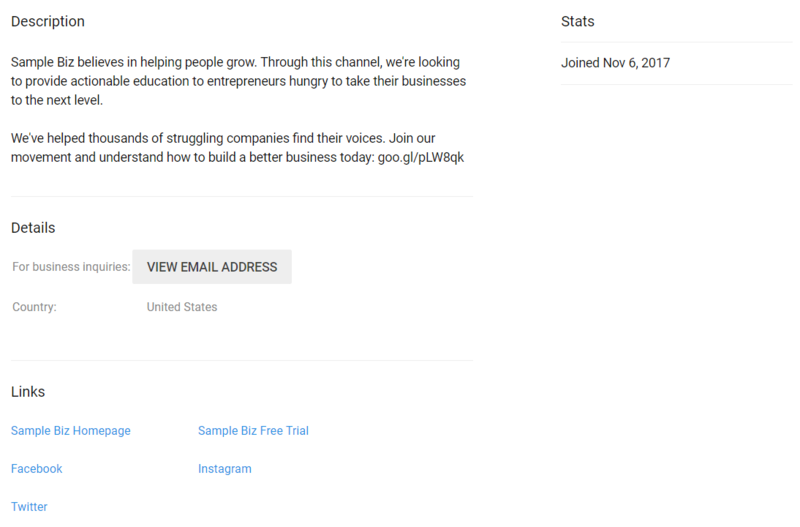 You can quickly add the “liked” videos and subscriptions on your YouTube business account page by selecting them in the “Add Section” menu of your profile. 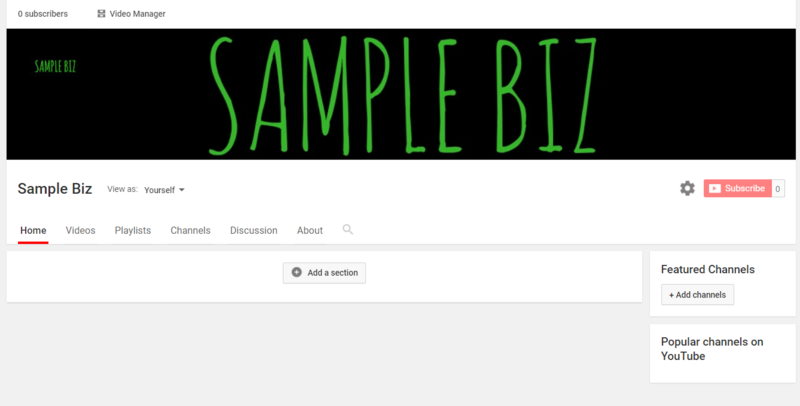 And at a glance, your YouTube business account feels complete, active and ready for action. Once your account is filled out, the ongoing process of optimizing your channel and content is the final piece of the puzzle. We’ll briefly touch on some tips that encourage new viewers and traffic once you’re ready for your first upload. Perhaps the best place to creators to start in terms of their videos is the creation of their channel trailer. Such videos are meant to introduce first-time viewers to your channel and ultimately outlines the type of content they should expect. These videos are typically less than a minute long and serve as a supplement to your channel’s “About” page. Short, simple and to the point, this trailer from Animoto is a great example. Each video you create is a new opportunity to score viewers and subscribers. It might be cliche, but every creator has the potential to blow up over time if they’re crafting the right sort of content that resonates with their audience. Sound like a lot of work? Maybe it is, but after getting the hang of uploading and creating content for your YouTube business channel, the fine details of optimization quickly become second nature. It should come as no surprise that video content is among the most shared on social media and the web at large. As a result, you can’t take an “if you build it, they will come” approach to growing your audience. Whether through social scheduling, commenting on other videos or running ads, finding new opportunities to promote your YouTube channel should be a top priority of any budding creator. Do You Know How to Create a YouTube Account That Draws Viewers? While it may seem like there’s a lot to juggle when creating a YouTube business channel, the initial setup is fairly straightforward. By sticking to the tips outlined in this guide, your channel will be better poised for a steady stream of new viewers in due time. If you’ve been struggling with your YouTube business account, what’s been holding you back? Any surprise success stories with your channel? Let us know in the comments below.